Chesapeake Forest Products Company opened this trail property in 1973 to help develop a public appreciation for the natural environment. The trails were opened to mountain bikes in 2007 to make this facility a multi-use trail for bikers, walkers, and joggers. Trails are currently marked by colored blazes on trees along the trails. Future improvements and development plans include adding a picnic area, a fittrail system, a restroom facility and re-marking of the trails. From I-64 take Exit 227. Merge right onto Route 30 heading towards West Point. After 6.6 miles turn right at traffic light onto Route 33. After 3/4 mile turn right into driveway at Wahrani Nature Trail. From I-64 take Exit 220. Merge onto Route 33 heading towards West Point. 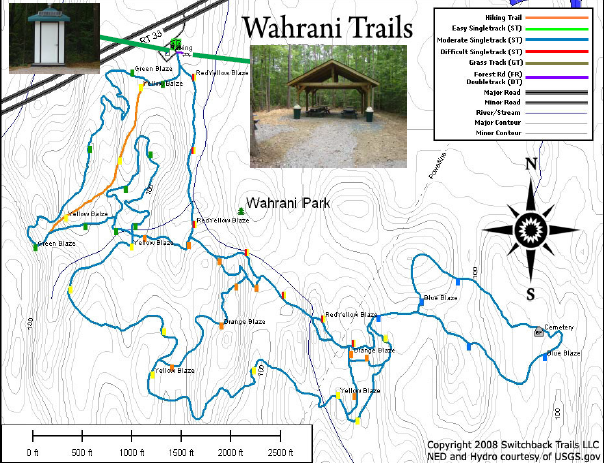 Wahrani Nature Trail is on the right 3/4 mile past the first traffic light. This is a multi-loop bi-directional single track trail system, about 5 miles long, with interesting terrain and challenging technical features. It has more elevation change than any of the peninsula trails. Some sections of the trail system are designated for hikers only due to erosion concerns.